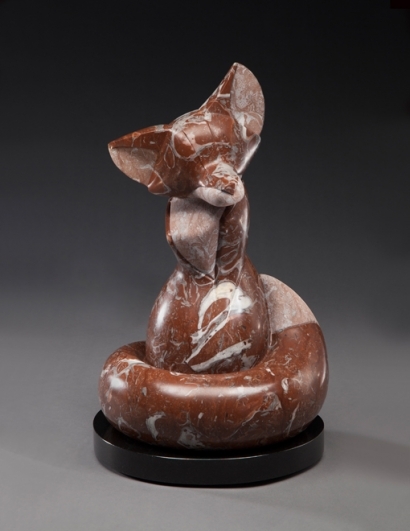 When I think of red marble I think of Rojo Balboa, and when I think of red animals I think of the fox. 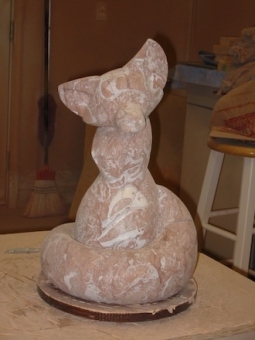 Several years ago, I carved Spiral Fox from this stone and really enjoyed both the stone and the design. I was curious to see how Rojo Balbo would look with both raw and polished stone, and designed Vixen with that idea in mind. 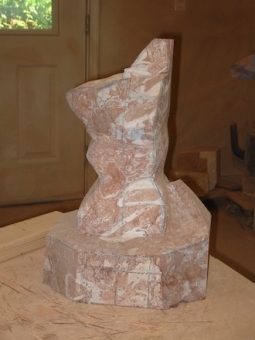 I wanted the curved tail to guide the eye through the sculpture to the lighter, textured stone, which continues up to highlight the head. 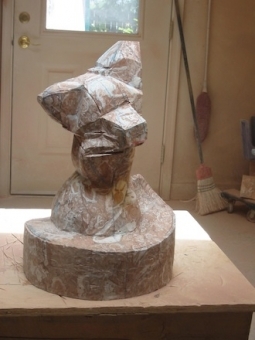 The figure is sculpted in Rojo Balboa, a raucous stone with fossil sea snail and bi-valve mollusc shells. 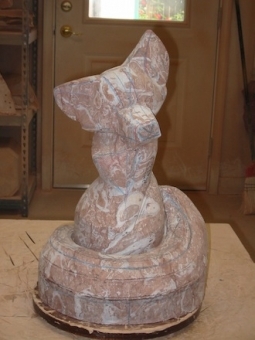 This marble needs a strong silhouette and high color contrasts for the design to read easily. The stone fits the animal. Fox are bold residents here in Loveland. Many live close to their human neighbors. We see them frequently day and night cutting across backyards, crossing streets, relaxing in the shade. I never lived near foxes until moving to Colorado, and they are always a treat to see. Silhouettes are cut front to back and side to side. Silhouettes are refined, forms start to take shape. 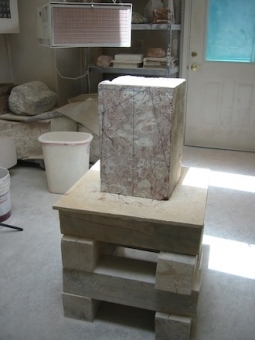 The end of carving. From here, I hand finish with rasps, files, and sandpaper.